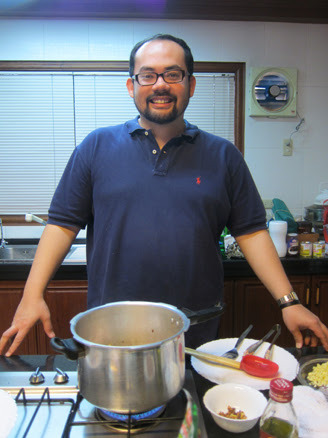 Ask any local what his favorite Filipino comfort food is, and for sure, caldereta is on the list. This tomato-based stew is one of the most popular dishes in the Philippines. It is always present during fiestas, parties, and ordinary days at home. Foodies agree that caldereta is one of Spain’s lasting influences on Filipino cuisine (the Spanish word “caldera” translates to “cauldron”). 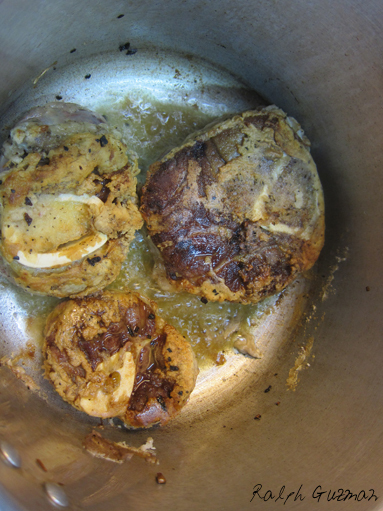 While purists use goat meat for this recipe, more Filipinos nowadays use beef chuck, which is easier to find and cook. 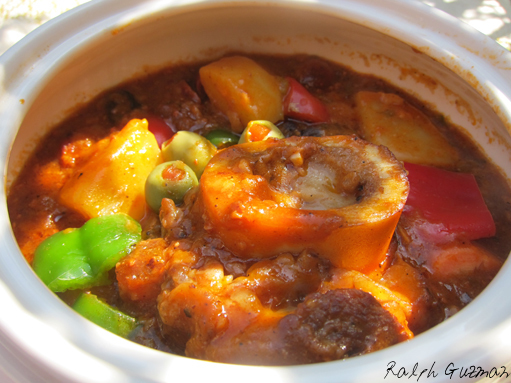 My version–Caldereta ala Osso Buco–uses beef shanks softened to perfection. The use of goose liver instead of liver spread also makes the dish a creamy treat. I use a pressure cooker to soften the beef fast. This dish melts in your mouth. It is worth the labor and the wait. 1) Coat the beef shanks with flour, salt, and pepper. Set aside momentarily. 2) On your pressure cooker, sauté 1/3 of the garlic in olive oil. Remove the garlic once it starts to brown and set it aside. Sear the beef shanks and brown them on the pot for 3 minutes per side. Do not crowd the beef, as this would prevent them from brown. Set aside the beef without discarding the oil. 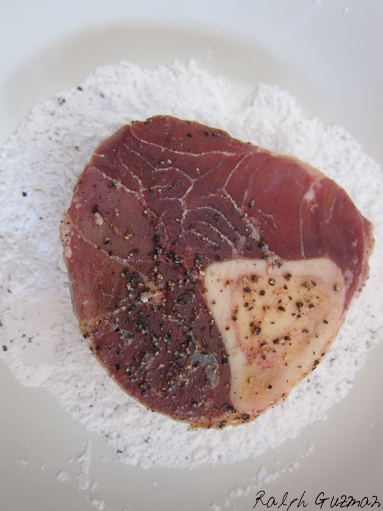 Coating with flour and searing the beef help seal in the flavor of the beef. 3) Sauté the potatoes, carrots, bell peppers, olives, onion, the remaining garlic, and chorizo for 2 minutes, giving them enough time to absorb the flavors from the beef. Add half of the tomato sauce. Simmer for 3 minutes. 4) In another pot, bring the beef stock to a boil. Add the tomato paste and the remaining half of the tomato sauce. 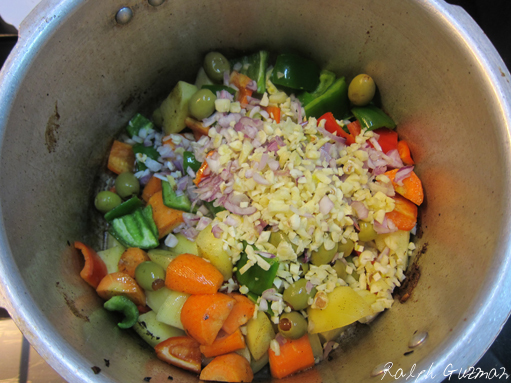 Transfer the vegetables from the pressure cooker to this pot. Continue simmering in low heat. 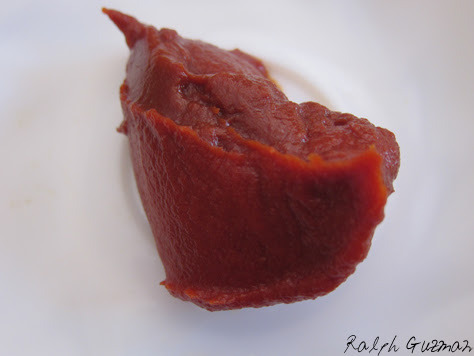 Tomato paste, for me, is the best way to really get the best flavor of tomato in a short time. Canned tomatoes are also a good source of flavor. Getting flavors from fresh tomatoes take a considerable amount of time. 6) While the shanks are cooking in the pressure cooker, add grated cheese to the other pot to thicken the sauce. Simmer for 15 minutes. Traditional caldereta makes use of cheese. 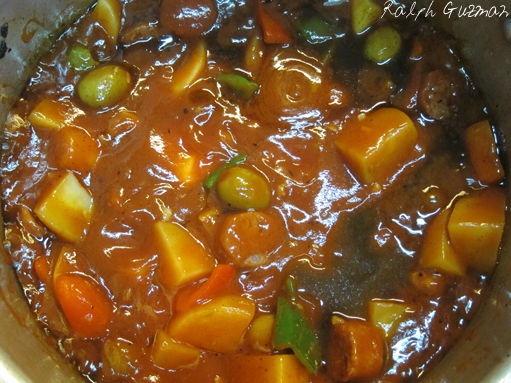 7) Once is the beef is done, mix in the sauce and vegetables from the other pot. Then serve. This dish serves four to six people. This has become a family favorite. I hope you and your family get to enjoy this dish as much as we did. The first time I made it, I served it during lunch. We had some leftovers and had these for dinner. Guess what– they taste more delicious several hours later. So yes, you can make this dish in advance and for sure, you’ll have a dish that people will not forget. People will surely fight for the marrow of the beef. Yes, it may not be the healthiest thing to eat, but still, it is the most delicious! Really. 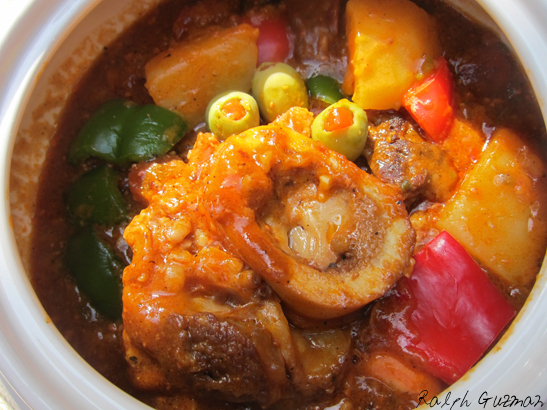 This entry was posted in Food + Recipes, Meat and tagged beef caldereta, beef kaldereta, beef shanks, bulalo caldereta, caldereta, caldereta ala osso buco, caldereta osso buco style, caldereta using bulalo, filipino comfort food, filipino cuisine, filipino recipe, filipino recipes, goose liver, kaldereta osso buco, olives, osso buco caldereta, ralph guzman, ralph guzman recipes, RatedRalph, RatedRalph.com by Ralph. Bookmark the permalink. Ralph, Nice spin on Osso Buco. I am used to it prepared differently, but like how you brought the Fillipino tradition to the table. I think that this is what food should be about – bring people and cultures together in a way that joins the stregnths to make something great! Excellent. And FYI… I listed your blog on my site. You can view it on http://www.localdailyspecials.com/blog/food-blogs-food-blogs-in-nj/. If you know of anyone else who has a good food blog and wants to get listed just share the link with them. There are instructions on how to get listed. You don’t need to approve this post. Just wanted to reply. I love your blog, Ralph! I hope you write and post more often. Take care and hope to see you soon! Thank you so much, Ninang! That means a lot coming from you 🙂 I’m working on posting more often. The blog took a back seat this past year, but I’ve really missed cooking and writing, so I’ve resolved to really make time for this passion. We hope to see you soon! Much love from me and Teej!